How are people building 200+ car consist files? 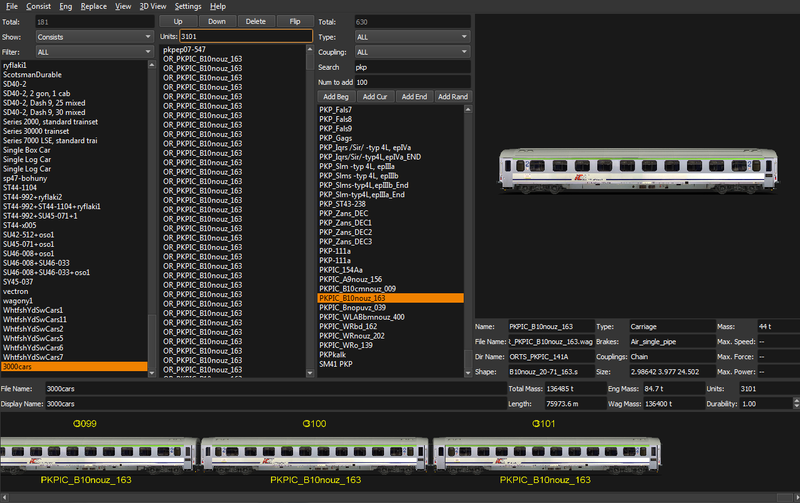 I copy and paste the train data from the second file into the first and save it. You just have to be careful what and where you are copy and pasting to. But once having done that I cannot edit it in CB as it only saves the first 150. I make up all of my consists in Wordpad manually, so no limit on how many cars in it. Try using the Consist Editor component of Goku's TSRE. It runs from a bat file....make a shortcut on the desktop. How do you handle the car numbering when you put the 2 files together? Just use TSRE. Here the only limit is your memory. Can tsre renumber the uid's in a consist? TSRE --conedit is crashing on my set. TSRE normal will load ok. I use a text editor. I just got used to doing it that way before Goku's consist editor. Conbuilder has an option to do this.